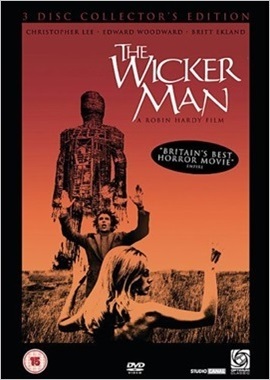 The Wicker Man is a cult film from 1973, staring Edward Woodward. Woodward plays Sgt. Howie, a police officer from the West Highland Police who receives an anonymous letter informing him that a young girl has gone missing. The missing girl, Rowan Morrison, lives on a remote Hebridean island called Summerisle. Howie flies out to the island to investigate and meets with resistance from the islanders from the first moment that he lands his plane in the harbour. He cannot land, the harbour master tells him, because Summerisle is private property and he needs to have written permission. Howie makes it clear that he represents the law and insists the harbour master send a dingy for him. The islanders are adamant that none of them have ever seen the missing girl: “She’s not from this isle,” they all agree. Even the girl’s mother insists that she has no daughter named Rowan. “I tell you no,” she giggles, but Howie is not to be put off so easily and insists on remaining on Summerisle until he can get to the bottom of things. Howie is a Christian and a deeply the religious man. Summerisle though, as the sergeant soon discovers, is a pagan community. The pagan faith is even taught in the school, where Christianity is—as the school mistress explains—taught only as a comparative religion: “Children find it far more easy to picture reincarnation than resurrection,” she tells him. Howie is, of course, abhorred by all of this and every moment he spends on the island he finds deeper and deeper depths to their depravity. As already mentioned, Howie is a man of a deep faith. His faith is not confined to just his religion however; he also believes that, because he is a police officer and represents the law, that the islanders will respect his position. But he is one man, alone in a very strange community; so perhaps he is own beliefs are also a little naive. The islanders appear to answer to one man only—Lord Summerisle (Christopher Lee), but Howie makes a point of putting off visiting the head of the island. Even when he is told that he will need the Lord’s permission for certain things Howie plods on regardless, and goes to see Lord Summerisle only when he himself deems it necessary. I have sometimes heard people refer to The Wicker Man as a musical. There is no denying the fact that The Wicker Man is a very musical film, but a musical? No. Not at all. In a traditional musical the cast can, and do, burst into song at the most inopportune of moments. Often for no reason. A lot of the music in The Wicker Man is just backing music (and singing). Most films have backing music! And when the locals of Summerisle do burst into song, which is admittedly quite often, there is always a believable reason for it. They do not just drop what they are doing and burst out in a vocal rendition of ‘There s Nothing Like a Dame’. No sir, The Wicker Man is nothing like a musical. There is, for example, a scene where the locals in The Green Man pub, where Howie is lodging, break out into a song about The Landlord’s Daughter (Britt Ekland). What is so unusual about having a good old sing song down the local boozer? Not a lot, I would say. But as the drinkers bang hips with the young lady in question it is apparent that they are mocking Howie and there is a dark under current running beneath the lilt of the music. Singing also occurs as part of the pagan rituals and ceremonies that appear throughout the film. The only song that comes to mind that is perhaps is a little unusual is Come Say How Do. A naked Britt Ekland sings this little ditty while dancing around her room, and banging on the walls, in an effort to entice the saintly Howie to “come say how do.” While Howie fights against temptation (and wins I might add) a pub-band, in the bar below, provide slow and rhythmic backing music for the young lady’s song. The Wicker Man is a cult classic; the 2006 remake is a poor comparison that might have made a few box office bucks, but will never have the same place in cinematic history that the original film enjoys. The original Wicker Man, with Edward Woodward, is a truly unique film with a great cast, a great script and—oh yes—some pretty good music as well.